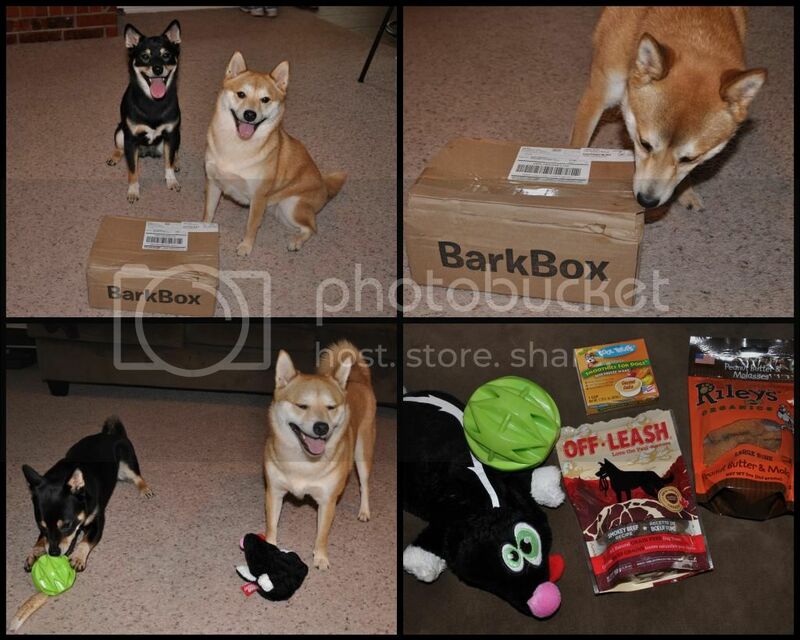 Wondering if anyone subscribes or has subscribed in the past to Bark Box and thoughts/reviews of items and shiba appropriateness. I signed up when there was a Groupon for $42 for a 3-month trial. I ordered the Medium dog box and have been pleasantly surprised! It's quite steep at the normal price, but Kira has thoroughly enjoyed the toys and treats that have been in the box lately. I have one more coming this month. I will take a few pics and give you a review after it comes in. Yes, I subscribe to it. It's definitely worth it for what you get. There are occasionally one or two toys where it's like, "yeah, Sagan won't play with this..." but other than that, the treats are nice, and the other miscellaneous goods. @Bootz You mean Pawalla.com? I think Bark Box got started around the same time, if not a little earlier. Pawalla gave it a year or so (approx. July 2012 ~ August 2013), and then rather abruptly and unceremoniously closed up shop. I don't think the enterprise was profitable enough. There were a couple other companies that tried to cash in on the subscription box trend too. Pawalla and Bark Box did the best job, from what I could see. Pawalla transferred its subs over to Bark Box when they closed up, I think. Thanks!! Been trying to figure out the name and it was bothering the hell out of me. Rikka, do they make you send back old toys like netflix dvd's? or do you keep them every month? and what size do you use for your shiba? My guy is right around 20-22 lbs. Would you go for the "middle" size? No, you keep the toys. Rigby gets the medium box. Smoothie - www.barkworthies.com - Mr. Barksmith's freezable peanut butter smoothie - I'm excited to try this one, maybe this weekend for the Shiba Inu meetup hike on Saturday! We tried this for Kazu. I don't remember if it was the small or med box. Either way we ended up getting a couple types of treats that weren't grain free. 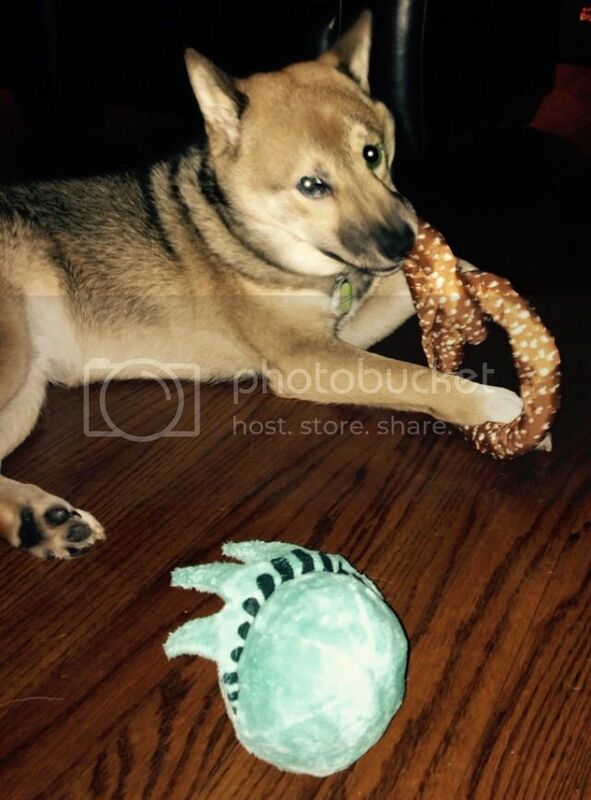 Most of the toys were good, but some were just regular plush toys that Kazu would destroy right away. The problem is you can't request for specific things (wheat free treats.. tough toys.. etc) so we stopped the subscription because of that. Overall we felt like we could use the money and buy a couple very durable toys instead. Super awesome and cute idea for dogs that dont have allergies and can play with all toys tho. @glitch - I agree the cost is pretty steep. It seems like the majority of the box is heavy on treats, which we are never out of in our household. A monthly box that provides more toy varieties would be more conducive for us simply because there are always the same, generic boring toys at pet stores but treats and a variety of them are easy to come by. The Groupon for $42 for 3 months was worth it, but $19 a month is a little more than I would prefer to spend on a gamble myself. 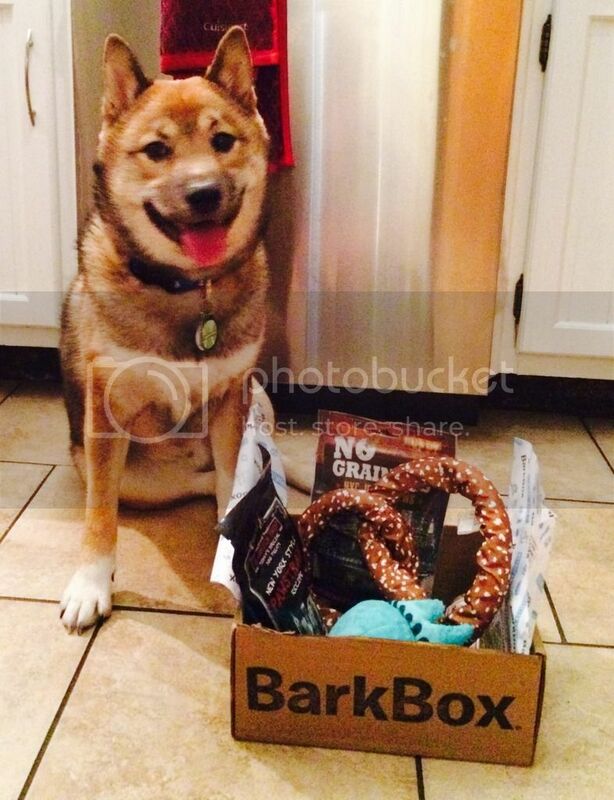 If anyone wants to try out a BarkBox, here is a coupon code for $10 off any subscription! Thanks for the posts eveeyone! The Cheese Please crisps are opened (dog and human friendly according to the package). We received a meatball mix that requires a pound of lean ground meat. We will prepare those at a later time. Also another bag of treats, that are lamb I believe, arrived. We didn't open them because we have plenty of biscuit style treats open at this time. Excited for the next box (hopeful there are no more bully sticks). 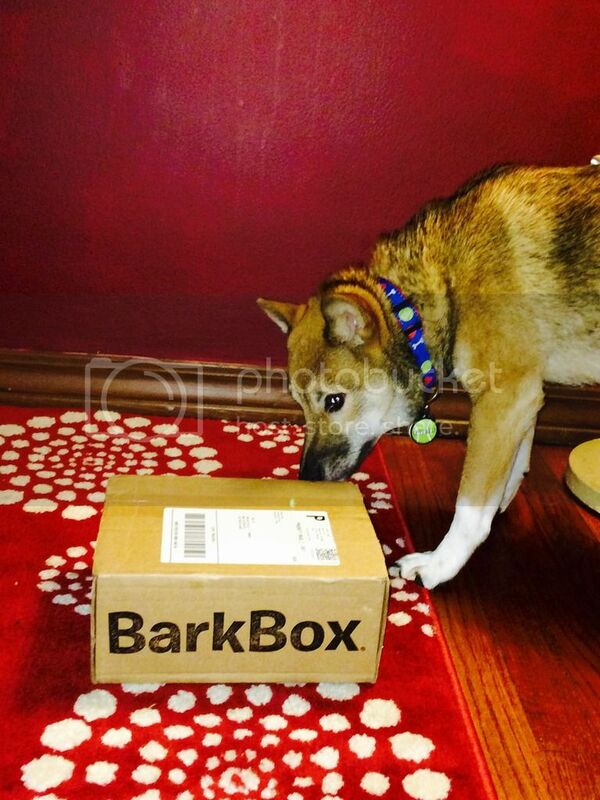 We have received Bark Boxes for the past 3-4 months and really like them! Deshka has toy ADD and receiving a new toy and various treats every month has been a really great thing for us! Especially since the closest pet store is 450 air miles to the south of us in Fairbanks! BarkBox is on sale for today ONLY!!!!! Considering how much I will spend on Kira in a month, that's quite reasonable! @Kira_Kira Thanks for the heads up! I had been wanting to give it a shot! I don't like making last minute decisions so I decided to pass. Hope they get a similar deal next time! 32% not the same! ETA - They don't do overseas. Just US & Canada. I could've sent the package to my mom in Toronto but they require a US/Canadian card too. Pfft. ETA 2 - They got in touch with me, there is a paypal option via 'gift' option. But they got in touch so late, I'll have to wait for the next deal. Plus, looking at this, I don't think they offer the deals via gift option. Poop. Oh well, I will try it out in the future. 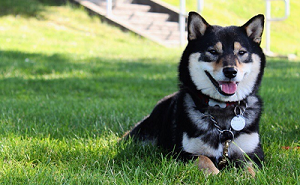 I posted it in the shiba deals thread, but I just found this thread in a search and thought I would add it here as well. I got the 6 month subscription (for medium size dogs) since I've been wanting to try it out. On the 15th of every month, BarkBox ships a bounty of high-end dog products to your dog's doorstep, where a bond of trust and mutual respect is finally forged between pup and postman. Tailored to the size of your dog, every box comes stocked with four to six items that can encompass anything from healthy treats to innovative toys and helpful hygiene products. Each box includes items of up to $50 in value. Plus, a portion of all proceeds goes to help dog shelters and rescue initiatives. This is amazing! We're about to refill his barkbox, so hopefully I can still snag this deal! Send it to your work address. That's what I did. If the address is different they treat you like a new customer. We just got out first box yesterday and it was shiba approved! We got two toys:a JW pets ball and a stuffing free squeaker toy with a squeaker that is too high pitched for humans to hear (genius!). They also love the treats which were grain free and made in the US/Canada. Thats awesome!! I didn't get the stuffed squeaky thing and I'm mad about it!! The riley's peanut butter and molasses are human grade and taste pretty decent FWIW. That little ball is banjo's new favorite toy. I got most of these last month except for the squeaky toy which drives me bonkers!! explain this peanut butter and ball thing please? The core of the ball is hollow. You simply load it up with peanut butter? Does it make a mess? @BanjoTheBetaDog, yep! Just put some peanut butter inside a hollow toy/ball. Not too much, use common sense, PB is a pretty rich treat. Get all natural if you can. It shouldn't really make a mess - the dog will make sure to get all of it! You can also freeze it if you want it to take longer. BTW, those smoothie cups sound ridiculous! I've got ice cubes trays and can make that myself! We didn't get a squeaker either! I would have killed for that! @jenn, is that the Bionic stick? Is it durable enough for gnawing? What size box do you guys get? We got the rubber ball,smoothie cup, truffle Mac and cheese treats and the cup of duck treats! @zandrame yes it is! it seems durable to me, though he was only really chewing it vigorously this one time. he's generally not a huge chewer unless theres a reward inside or he's super bored. 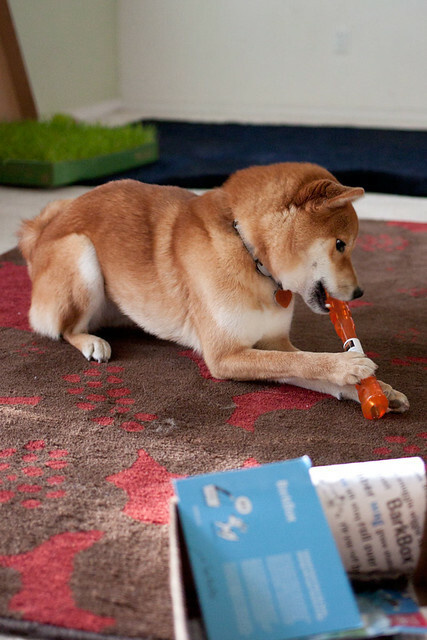 :P amazon reviews say that its not for aggressive chewers, so ymmv. @Bootz, do your girls eat ANY treats? or are they picky? I think it is totally worth it. If you go on amazon,the value of the box is greater than its cost. Even when I get something "just eh", its still pretty good. Their birthday is coming up too! But we have a list of things "to do/buy" for the kids already. Example: 2 x full blood panels, travel crate for car, annual check up, Honest Kitchen...the list goes on if i can get everything i want! I'm all for spending on them :( But my husband limits my spending! Those treats smell great! The beef ones smell just like you opened up a bag of beef jerky! The peanut butter ones are a big hit too. I didn't notice that they were human grade... I don't think I'll be trying them though lol. The squeaker toy can be found at www.hear-doggy.com. The treat ball worked great for filling the little grooves with dried lamb lung. I just broke it into pieces and shoved it down into the grooves and in the center so that she had to work to get it out. Max loved his first box. I personally thought he wouldn't want some of the toys, but I guess I'm not a good judge of what he'll like! I was spending way more money on toys and treats for him, so if he continues to show the same excitement month after month it'll be worth it. I don't think 20 bucks a month is a bad deal as long as he's enjoying it. My two cents. We've been getting about 2 toys a month that are usually priced around $10 or so; if nothing else it's worth the toys we are getting. We usually save one and some of Rei's favorite toys are from them, currently this month's watermelon. Actually this month's box has been her favorite so far-she inhaled the deer chew, loves the "candied" sweet potato and is ok with the chicken biscuits. This is from a dog who is NOT food motivated in the slightest. I can see why for some dogs it isn't worth it. I tried the year package on a discount so here's hoping it's still good and she still likes it. I heard that all the boxes are themed for the month-- like Septembers is back to shcool and Octobers will be Halloween. So since im a sucker for themes we're going to try it and see how it goes. Ill post pics as soon as we get it. 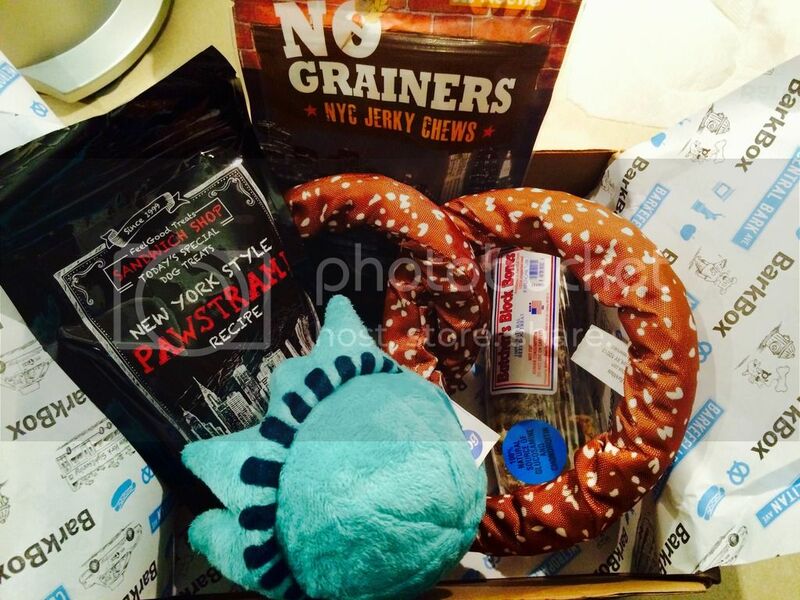 I did the 1 month and with this link (https://barkbox.com/r/9DH5R4CRM3) I got a free box so it broke down to being $15 a box which isnt too bad at all I dont think. @Tweenersmommy -thanks for the link and coupon. I subscribed for six months! Wow that's a great deal. I may sign up again with a different email address. The coupon is only good for new subscribers. Their customer service is amazing. Just go on the website, hit chat, be nice and I'm sure they'll honor it with a renewal. Tweeners Barkbox is here! It's New York themed (we're guessing because of September 11th?) and he loves it! It had two toys, a rope pretzel and a squeaky ball that looks like the statue of liberty's head. He was OBSESSED with the ball from the moment that we opened the box so I feel like that alone was worth the cost of what I spent on the box (about $15 with the coupon code). It had two bags of "new york"ish food flavored treats (like pepperoni pastrami) which he seemed to really like, and a butchers block trachea chew which we have not tried yet. The only downside to the box was that Tweener became obsessed with pulling at the tag for the pretzel and in about 5 minutes had the nylon pretzel cover off the rope center-- so its not a pretzel anymore...Oh well at least he seemed to enjoy himself. I think that I'm going to extend his subscription but now the dilemma is whether or not to go with the "tough chewer" package since he apparently can destroy things in record speed otherwise. If you are signing up for the first time you can Give back while treating your pup by purchasing a BarkBox! When you use the code (NYCSHIBA) the new york shiba rescue gets $25 of your purchase donated right back to them. 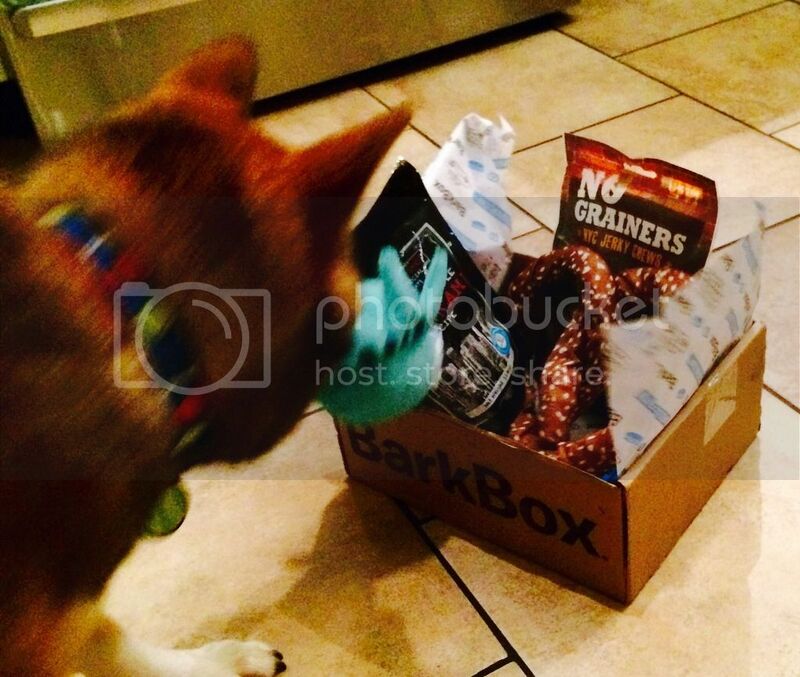 BarkBox is a monthly pupscription box full of awesome dog treats and toys! Thank you so much for your help! Just a thought if you don't have a Groupon or you want the money to do good for shibas in need. 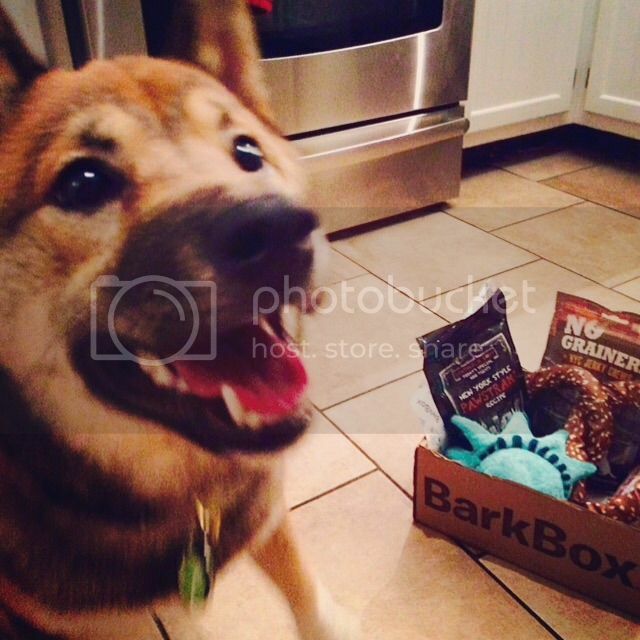 @Tweenersmommy -Quakey's Bark Box arrived too and he loved it. Like Tweener, he loved the squeaky ball! He didn't pay too much attention to the pretzel. He loved both the treats. We have not tried the butcher's block trachea chew yet. @Antoinette, yay I'm glad he liked it!